We had grand plans for birthday meals but shelved them in the end, in favour of simplicity and something nearby (blame the rain and our sleep-addled state). 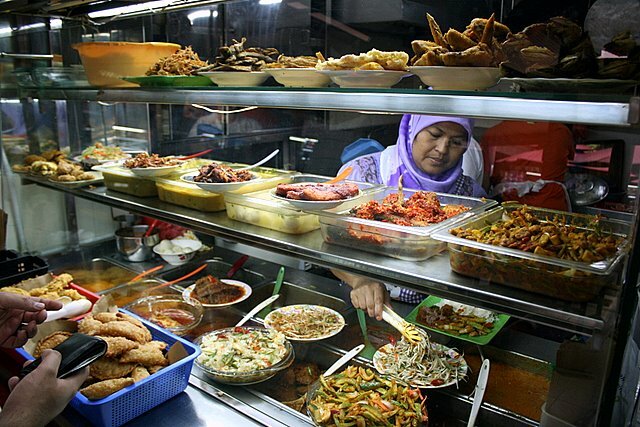 Hubby loves Malay food, so we went to Bedok Corner Food Centre where there's lots to choose from. We shared some nasi padang. Rendang, achar, begedil, sambal ikan bilis petai and stirfried beansprouts - all quite good! Yeah, who says you need to go to a restaurant for a good meal? Here you can feast on many tasty dishes of your choice. I felt like going for a second round to try more things! And this is just one stall out of many others in the food centre. 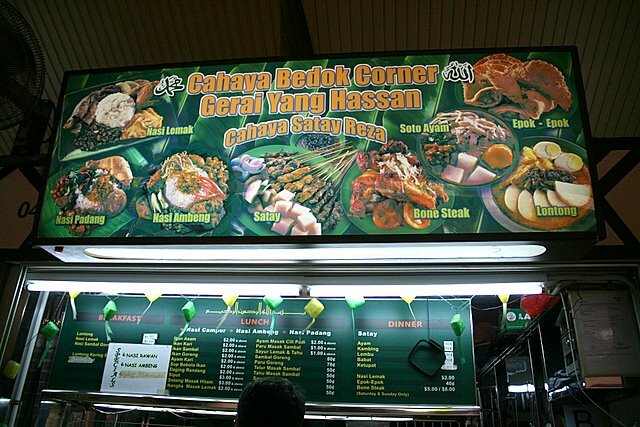 The Nasi Padang is from Cahaya Bedok Corner Gerai Yang Hassan (Cahaya means Light and Gerai is Stall, so it roughly translates to "Yang Hassan's Stall, the Light of Bedok Corner"). Hmm, I just noticed their menu seems to infer that nasi padang is served only at lunchtime. Dinner is satay, nasi lemak and other snacks. Bedok is also food haven. Hi, you have a great blog here. 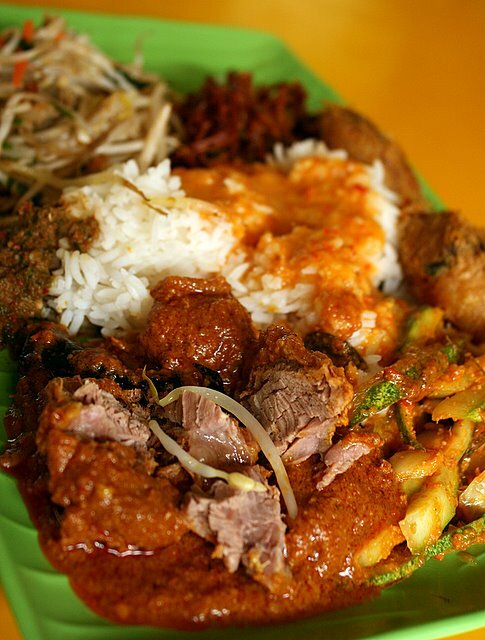 From your recommendation, I chose to try the Nasi padang stall as I love Malay food... Unfortunately, it was a pretty disappointing experience. I ordered the daging rendang, kari ikan and fried long beans. First off, when I asked how much for the total, the auntie quoted me $9.00 but as soon as she saw the stall assistant scooping a small bowl of assam curry for me, she changed it to $9.50! I asked the stall assistant whether its normal for them to charge for additional curry but she just smiled... Not a good start..
We had two pieces of the daging rendang, the first piece was okay, though a bit fatty but the second piece was as hard as a rock! We could not cut it even with metal spoons. So, thumbs down for that. The curry fish, we chose the "batang" fish fared much better. The vegetables, not to my liking, as it was still half raw. I personally prefer my veg cooked. Anyway, overall the food was okay but what really spoilt it all was the fact that this is my very first time having to pay for additional curry sauce.. It's a bit too much for me. OM*G S$9+ for ONE plate?? I know stalls tend to charge more for fish, but whoa! And extra charge for curry sauce! This is way too much. Sorry you had a bad experience. No worries, I guess aunty just had a bad day... I still love my nasi kandar anytime over nasi padang. Anyway, 5 thumbs up for your blog. I now use your blog to look for food locations!! Thanks, Linda! And anonymous too!